but admit it we all like a few goodies too! Well, here is you opportunity for more than a few goodies! WISH LIST GIVEAWAY on 18 blogs! THERE ARE DIRECT LINKS TO EACH GIVEAWAY UNDER THIS GRAPHIC! My basket is crazy and eclectic and full of random things I LOVE! My FAVE lip gloss from Wet N' Wild! Here are some detail shots! The Bordeaux Wrap can be a scarf, a hooded scarf, a shawl...the possibilities are endless. 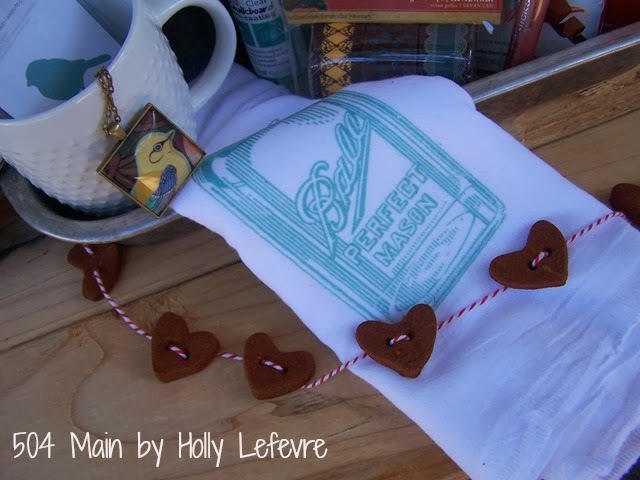 Cinnamon Applesauce heart garland, flour sack towel with Mason Jar graphic, a square birdie pendant necklace. This giveaway is open to US Mailing addresses only (sorry!). My favorite is the banner:) thanks Holly! The cinnamon garland is my fave. Thanks for a chance to win. I love the towel with the mason jar! I bet the cinnamon garland smells heavenly! I need to add that to my Christmas decor. I love the cinnamon garland. What a fun and unique idea..
chocolate and a kitchenaide mixer are my fave things. That Kettle Corn looks amazing! Oh my...what a lovely basket! The banner, the garland, the magazine. My, you know how to do a basket. Beautiful. Fun giveaway...love the little garland! I love the JOY banner! Thanks for the fun giveaway! Love the TJ's Green Tea!! It's all so cute, Holly! Love that banner! Thanks for such a fab giveaway! I think my favorite is the cinnamon garland! Sounds perfect for Christmas! This is SO fun, Holly! I just love this basket! I adore the Cinnamon Garland on Bakers Twine. Love everything in your basket but would love to see an issue of the American Made magazine!! 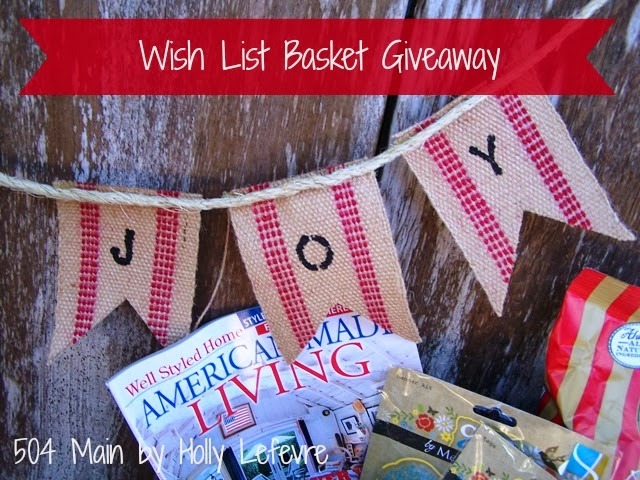 love the giveaway and great basket! I love the Flour Sack Towel with Mason Jar Design- so, so cute!!! Specifically from your basket I love the Mason Jar towel and the cinnamon heart garland! In general though, chocolate is always at the top of my list. The Chalkboard paint, I have always wanted to try it!! I love the cinnamon ornament garland - so cute! The Bordeaux wrap looks really cool! Sour candy is one of my favorites, in or out of a basket :) Thanks for the chance to win!! The Bordeaux Wrap looks cute! I love flower sak towels! I love Sour Patch Kids! I never say no to a new coffee mug! OK...You made me LOVE that Trader Joes Candy Cane Green Tea. I am hooked!!! I'd be most excited to try the kettle corn! My favorite thing is hard to choose.....I guess right now it's snuggling with my hubby! Great basket! Thanks for offering such a great giveaway! I love the joy banner in your basket...super cute! Love it Holly, great to meet you! Love the Mason Jar towel. The wrap is pretty neat, would like to try it!! That Bordeaux Wrap would be an awesome accessory! I love the coffee mug and the wrap (the coffee mug mostly because I am a huge coffee mug collector!). The wrap is adorable and I love wraps that can be used in so many different ways! I love anything chai tea! And the mason jar towel is sooo cute! A simple favorite thing of mine is Godiva cocoa. I like the peppermint mocha! My favorite thing is anything NY Yankees related. I love the kettle corn! What a fun basket! Hard to pick one favorite but I especially love the banner. My favorite is the towel, so cute! I love the Bordeaux wrap! that towel is so cute! Your basket looks lovely! I am loving the Bordeaux Wrap. Beautiful! Hello, I have really enjoyed this blog hop! My favorite thing in your basket would be the scarf, hoodie thing :) Thanks. Vicki. Well considering my hometown (Muncie, Indiana) is where the "Ball Jar" was created, I am a little partial to that towel. I collect everything Ball Jar, so this would be a nice addition to my collection!! I would love the Bordeaux wrap!! It looks like so much fun!! I really like the mug I collect them never saw one like that. thanks for the giveaway. I love that cute little banner! Such a cute basket! The Bordeaux wrap looks very luxurious...but the bird necklace is adorable. Very nice assortment in your basket and I am having a ball bloghopping today! Thanks. All of it!! :) Especially the Sour Patch Kids!! I'm excited for the Bordeaux wrap! I like the The Bordeaux Wrap. Thanks for the chance to enter. Love the eclectic look! But it all somehow works!! My favorite thing in this basket is the tea towel! I have been eyeballing them for some time. Thank you for the chance! Happy Holidays! There's a lot of awesome stuff in there! I think my favorite thing in there (at the moment) would have to be the Sour Patch Kids. I never buy myself candy... but I really love those and would definitely eat them if I won!! The wrap would be an awesome accessory and nursing cover! I would love to try it. I love the handmade JOY banner. I love the cinnamon heart garland! The shawl,scarf is my favorite! !! The wrap looks like a great items! I love Urban Decay's Eye Shadow primer. Lasts all day! Amazing!! The wrap and the Ball towel! 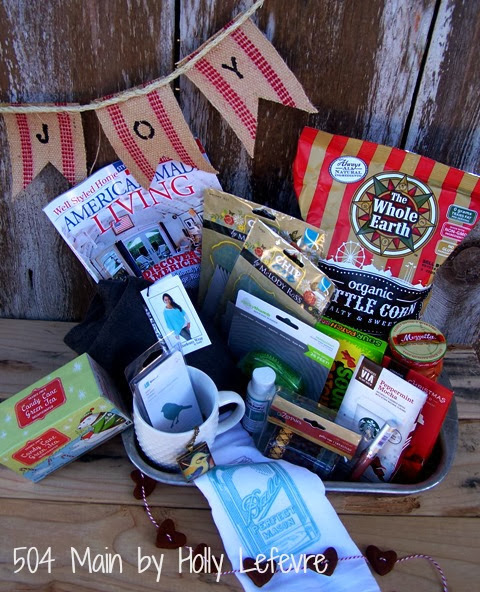 Such a fun basket... the wrap looks really cozy and I love the mug! I am liking the tea and caramel corn. I love the Starbucks blends and the coffee cup. I love the Mason Jar Towel ~ I have the Bordeaux Wrap and LOVE It! I love the towel, and the wrap, and the bird! I like the bird necklace - thanks for a great giveaway!! I love the Bordeaux Wrap. But it is all a great basket. Thank you for the opportunity. Chocolate is my favorite thing, but that Kettle Corn sounds yummy! Hard, but I'll go with the kettle corn, yum! The Bordeaux wrap, by far is my favorite. Thank you for the opportunity to win this bunch of goodies. Happy Holidays! The heart garland is my favorite! My favorite thing in the basket is the Bordeaux wrap! I love Sour Patch Kids, too! I just love the Starbucks Peppermint Mocha (Via) and the mug is just adorable. My favorite item is the tape. That wrap looks so cozy and pretty too! Those two things don't always go together! This is such a fantastic giveaway. Thank you! I'm LOVING that mug and all the Starbucks stuff to go in it! I LOVE Sour Patch Kids! And the hoodie/scarf/wrap thing looks cool! I love the Joy banner! I love the mason jar tea towel. I LOVE tea towels. I really like the Flour Sack Towel with Mason Jar Design, so pretty. I love the Flour Sack Towel! Love Bakers Twine and Washi tape. And grasshopper cookies! I love the Bordeaux Wrap and the cinnamon garland. I am digging the garland!!!! I love the Mason jar towel. I enjoy making dish towels for well...just about everyone. Thanks for the op and heads up. Good luck everyone. I love the Handmade "JOY" banner! My favorite thing in the basket is the little coffee cup. Love that Ball jar towel! I'd love to have a bunch of them for the kitchen! Where are they from? The Cinnamon heart garland. Such a cut idea. Love your basket!! I love everything in it! The garland is pretty and love the flour sack towel. The wrap! So cozy and soft. love that flour sack w/ the mason jar graphic! I think that banner is going to win as my favorite pick. Too cute. I love the Flour Sack Towel with Mason Jar Design! The mason jar towel is tooo cute! Everything! Including the coffee mug and Starbucks goodies. I think the Bordeaux Wrap is my favorite. I love the Bordeaux wrap. I love the mug. I've been looking for a new one for my morning fix! That kettle corn sure looks yummy! I am LOVING The Bordeaux Wrap!! I LOVE the Joy banner! So cute! I love a good coffee mug! The one in there looks perfect! That wrap looks so neat, never seen anything like that. Love the towel with the mason jar. I'm all about mason jars for decorating. I love the mason jar towel and I also think that a cup of this would be great right now, it is cold and windy here -Trader Joe's Candy Cane Green Tea would be so refreshing. I'll admit it. . . I love Sour Patch Kids! The bird pendant is my favorite out of your gorgeous basket, though. It is so pretty! Love your favorite things! my fav is the flour sack towel! Cute kitchen towels are one of my favorite things! Wow, what a great basket! I like the mug, the coffee, the shawl/hoodie, the kitchen towel, and the handmade banner!! I just adore the little birdie necklace!! My favorite things from your basket are the mason jar towel and the threshold coffee mug. That really cute necklace. Thanks for putting together such a great basket! Lovely basket ~ love the wrap! I love it all,but the banner and flour sack towel are just too cute! The JOY garland is adorable! The wrap looks cute; love grey! I think my favorite is the cinnamon garland! I LOVE Starbucks Peppermint Mocha! !